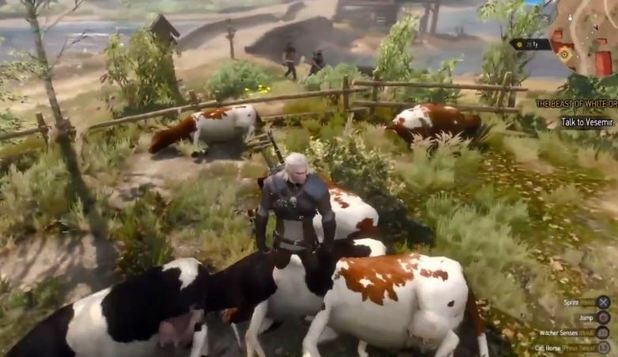 Everyone wants to know how to make easy money in The Witcher 3, Now there is an exploit for unlimited Crowns (in-game money) in The Witcher 3: Wild Hunt has surfaced, and all it takes is grinding cow kills for as long as you want. You don’t have to worry about being a filthy cow murderer, the cows re-appear after a while, so you’re safe from feeling the unnecessary sadness over killing fake animals (I feel it all the time – damn feelings). The White Orchard is filled with cows, so head there to start the slaughtering of innocent re-appearing cattle. Once you’re there, kill all the cows you can and harvest their hide. Take the hide to local merchants, sell it and meditate for two hours — by then the cows will have re-appeared. The thing to be wary of is, you’ll be rolling around in so much money that merchants will run out of money to pay you. Prepare to visit merchants all across the world to sell your hides.